I’ve decided Enchiladas are underrated —to be honest, I never even ate one till a couple of years ago but these SWEET POTATO + BLACK BEAN ENCHILADAS are everything! They take just 30 minutes to prepare, can be partially or fully prepped ahead and after baking in the oven you have a warm, cozy and super satisfying meal. And these hearty Sweet Potato + Black Bean Enchiladas have been a real hit in our house! 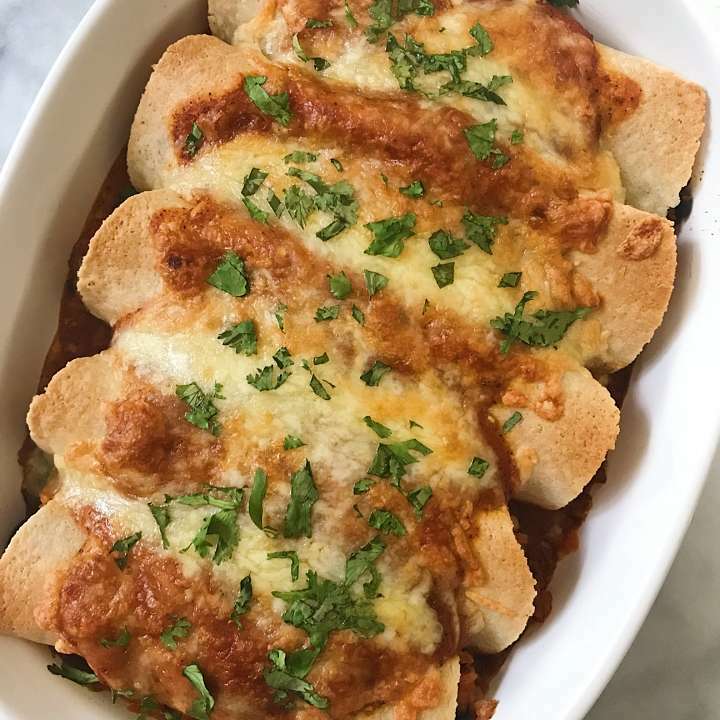 The enchiladas are filled with a crowd pleasing mix of brown rice, black beans, onions, roasted & spiced sweet potatoes and salsa, topped with Monterey jack cheese and baked with a homemade red sauce. 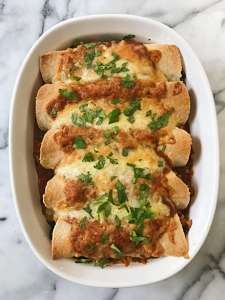 A healthier take on the classic enchilada, they taste indulgent and are super satisfying but are packed with goodness. 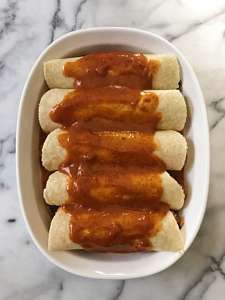 More on the enchilada sauce… recipe adapted from Cookie + Kate, it is a simple recipe with lots of yummy spices and it comes together quickly. You could always use a store bought sauce but we think this is definitely worth the 10 minutes to make it! Enchiladas come together quickly and can be partially or fully prepped ahead as they heat up well. Hearty Sweet Potato + Black Bean Enchiladas with a simple homemade red sauce make a delicious vegetarian entree. The enchiladas are filled with a crowd pleasing mix of brown rice, beans, sweet potatoes and salsa, topped with Monterey jack cheese and baked. Super easy and can be partially or fully prepped ahead. NOTE:Baking time for enchiladas is about 45 minutes but prep time includes 20 minutes of roasingt sweet potatoes. Roast Sweet Potatoes: Preheat oven to 400 degrees F and line a rimmed baking sheet with parchment paper. Place sweet potatoes in a large bowl, add olive oil to very lightly coat (about 1 tablespoon), cumin, chili powder and salt. Toss to combine. Place sweet potatoes in a single layer on baking sheet and bake for 20 minutes, or until tender. Set aside. Meanwhile,saute the rest of the filling: In a large skillet, heat 2 tablespoons olive oil over medium heat. Once the oil is shimmering, add the chopped onion and cook, stirring often, until the onion is tender and translucent, about 5-7 minutes. Add jalapeño and saute 1-2 minutes. Add cooked rice, black beans and salsa. Stir to combine and cook over medium heat for about 7-10 minutes until well heated. (NOTE: Depending on how thick or thin the salsa is,sometimes I will add an extra ¼ cup salsa while stirring and heating the mixture). Remove from heat. Add cooked sweet potatoes to cooked rice and bean mixture and toss to combine. Give is a squeeze of lime juice if desired-- I have done this from time to time for a little tang. Warm Tortillas to make more pliable -- place them on a plate, gently cover with a damp paper towel and microwave 20 seconds at a time, exact time will depend on strength of microwave. Pour ½ cup enchilada sauce into your prepared pan and tilt it from side to side until the bottom of the pan is evenly coated. 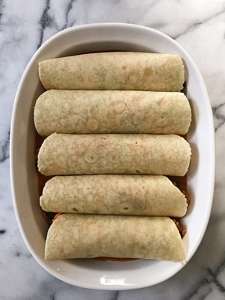 To assemble the enchilada, spread ½ cup of the sweet potato-black bean-rice mixture down the middle of a tortilla, sprinkle with Monterey jack if desired, then snugly wrap the left side over and then the right, to make a wrap. Place it seam side down against the edge of your pan. Drizzle enchilada sauce evenly over the enchiladas, leaving the very ends of the enchiladas bare. 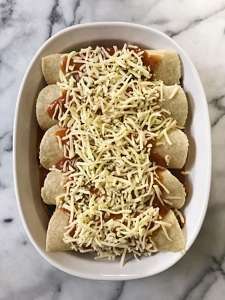 Sprinkle ½ cup or more shredded cheese evenly over the enchiladas. Bake, uncovered, on the middle rack for 15-20 minutes or until cheese melted. TIP: You could prepare everything ahead of time and just assemble and cook when ready to eat. In that case, you may have to cook longer, more like 25-30 minutes to make sure everything is heated through. Remove from oven,sprinkle with cilantro and serve.